The Fitness Team invites you to join us for the 2018 Charlestown Pie Baking & Shelf Decorating Contests! 11:00 AM: Guess who is dressed up in the Turkey Costume! Monetary donations: Come to the Fitness Center with a monetary donation from now until Nov. 16th. Donations will be used for $5.00 Giant Gift Cards for SWES & The Marian House. 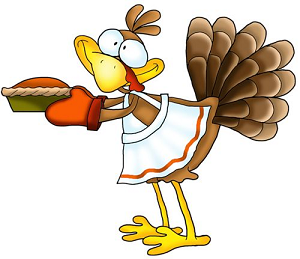 Pie Baking Contest: You are invited to bake one Holiday Pie (any kind – savory or sweet) for the contest.. All who attend the contest (residents and staff) will get to taste each pie and vote for the pie they prefer. The pie with the most votes will be the winner. Shelf Decorating Contest: We are encouraging as many residents as possible to decorate the shelf outside their apartments. Shelves will be judged on Tuesday, Nov. 13th to determine the Top 10 semi-finalists. The winner will be announced at the event on Nov. 16th.